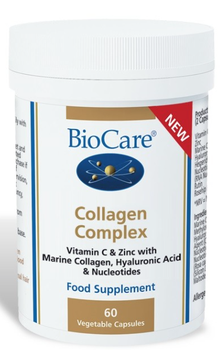 A high potency nutrient complex with marine collagen, antioxidants and nucleotides . Rapidly absorbed, superior form of type 1 collagen - identical to the collagen found in the body - with excellent research. Collagen, hyaluronic acid and nucleotides are components of skin and joints. Vitamin C, amongst others, is important for collagen formation and supports the structure of bones, joints and skin. Zinc contributes to the maintenance of normal skin and hair.